Is the new season of True Blood not enough of a fix for you? Then check out the Graphic Novel! 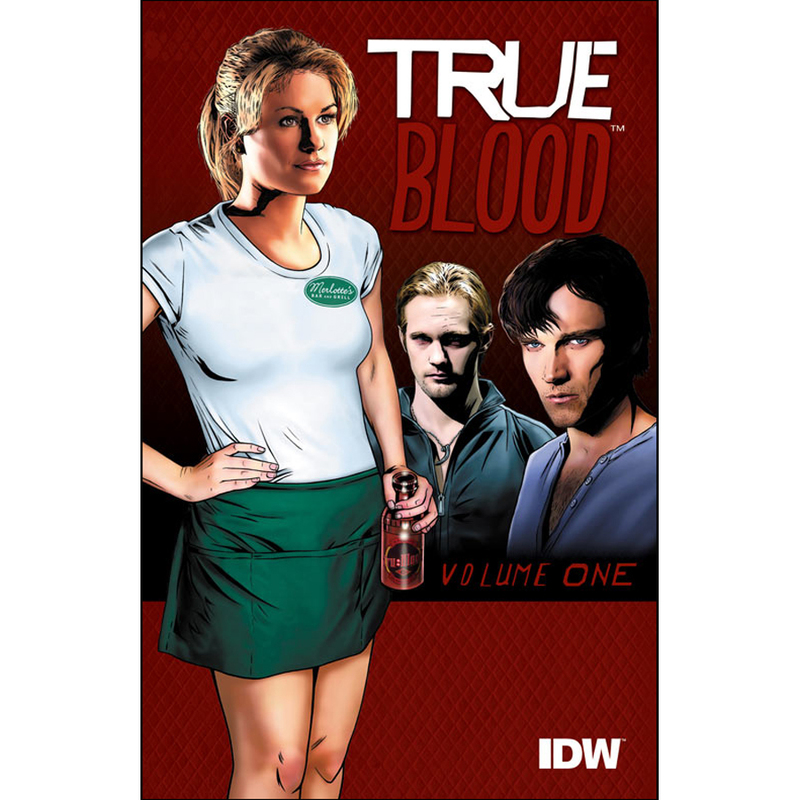 True Blood Volume One: All Together Now, published by IDW, is a must-read for any avid True Blood fan. I had the pleasure of devouring this book a few days ago, and I must say that it complements the show (and Charlaine Harris’s books) wonderfully. On a hot, stormy night in Bon Temps, Merlotte’s is filled with the usual clientele and employees: Sookie, Sam, Lafayette, Tara, Jason (with a trashy date, of course! ), and eventually Eric and Bill. In addition to a few additional redneck customers, there is one individual who isn’t expected. His name is Ted, and he’s an Imp Shaloomp, a spirit worshipped by the local native Americans that feeds on the evil, guilt-ridden thoughts of those around it. Ted has a bone to pick with someone, but until the truth of that grudge is revealed he’s going to get thoroughly stuffed on everyone’s worst memories. This book was fantastic addition to the True Blood world. Alan Ball, the creator of the show, plotted out the novel. He wanted to add on to the True Blood experience by providing some great back story into the people and creatures we love, which is delivered really well. The reader gets to journey into the heads of each of the main characters and gain a little more insight into their past, which only adds to us understanding why they are the way that they are. I was worried that the feel of the book wouldn’t fit with the story as I know it, but luckily I was proven wrong. Using the story plotted by Alan Ball, writers David Tischman and Mariah Huehner nailed it. The writers managed to capture the voices of each character to a T, and it made it just like watching a featurette to one of the television series. Jason had his sweet southern ignorance, Tara her foul mouth, and they even rip on Sookie pronouncing Bill’s name “Beeel”, which made me chuckle out loud. I was also impressed with the art, which was drawn by David Messina. Though not as accurate as photographs (which is to be expected), the artist managed to capture the gestures and expressions of the main characters, from Eric’s brooding stares to Sookie’s exasperated shout-matches with any number of people who piss her off. I was a bit thrown with the accelerated nature in which the reader was thrust into the story, when in both the novels and the television show there is a little more time for build up. But having said that, it didn’t jar me that much, and once I realized what was happening it wasn’t anything different than seeing Mary Anne’s clawed hands appear or watching Sam turn into a dog. I would highly recommend this as a companion to the show. I know what it’s like to be an avid fan of something, and everything that goes along with that, including getting everything you possibly can on the characters you love so much. This book feeds that need in the best way possible. Getting insight into the characters, reading stories we’ve never heard before, only adds to the characters’ appeal. This is the first in a series of Graphic Novels by IDW, and I know that the upcoming ones will hold me over in the long winter months between new seasons on HBO. Season 4 is just beginning; you can check out this Graphic Novel to get yourself re-acquainted with these characters after the hiatus. You won’t be disappointed! Book one hit shelves on February 15th, 2011. Previous postThe Official Pottermore Video is Up, Be Prepared to Get Excited!